I have a weakness for vintage craft books. I can never resist them when I'm at thrift stores. I have a book on how to re-use L'eggs eggs, and they don't come in eggs anymore. Mostly I focus on needlework and jewelry making books, but if it looks likely enough I'm not at all choosy really. I also like magazines. I've been slowly archiving patterns from my 1940s-50s crochet/knitting magazines. Inventive Jewelry Making by Ramona Solberg , pub 1972. 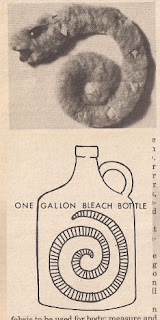 The description for this picture says Angel pendant of inedible baker's clay by Vernon Koenig, in collection of Mrs. Spencer Mosley. Lucky Mrs. Mosley, because I love this angel so much. She just looks so happy doesn't she? I really want to do something like this, but maybe in soft sculpture and bright colors. The whole book is wonderful, there are some great projects and I'll be adapting some of them for projects on the bead site. 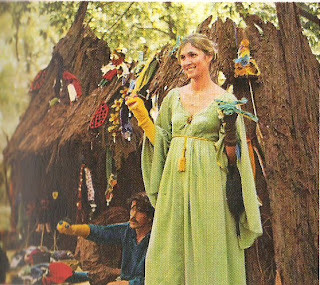 You look at this picture and think Ren faire right? Well, I had to post it because the blurb made me smile. having opted out of the "rat-race", many hippies manage to gain a small income by making and selling objects such as bead necklaces or the soft toys shown here. Okay.. THAT'S what I want to be when I grow up. I want to be a hippie making a small income by selling bead necklaces. Esp. if I can have that dress. Really truly. Recently I found a whole bunch of Workbasket magazines from the 70s. A box of about 125 issues for 15.00 at our local ASPCA thrift store. The September 1977 issue had 3 great projects to reuse plastic and since crafting green and upcycling are just wonderful, here they are. 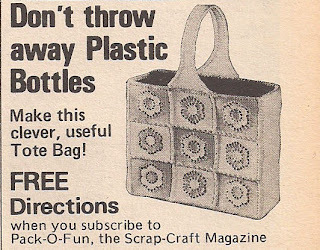 First is this ad for Pack-o-fun magazine which suggests using plastic bottles to make a tote bag. Easily enough done, but I'm thinking milk jug plastic and soda pop bottle plastic crocheted together like the beer can hats would be awesome. Pre-punching pieces of plastic for little kids to sew together using yarn with a tape needle would work well too. Idea #2- Using a piece of plastic from a bottle to shape a coiled snake with. The snake in the article was sewn from bias cut fabric, but the idea would also work for an amigurumi snake, or even if you cut a spiral from a 20 ounce soda bottle working around the whole bottle as the center of a fun bright springy bracelet. Idea #3- This one uses yogurt containers to make an herb planter. Love the idea. 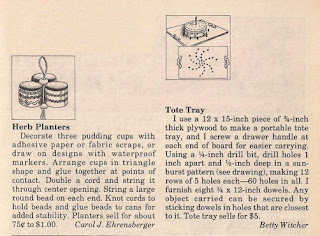 I also love the idea next to it to make a carry tray using plywood, handles and holes drilled partway through the wood in a sunburst pattern that can be fitted with dowels to hold a cake or something securely in place. Very clever. Happiness is stacks and stacks of books. And I'm absolutely blissful. I'm so envious of you. That sounds like a great book!